In discussing his approaches to what he has termed his A- and B-films in 'Impossible Stories', Wim Wenders has written that the 'A-films' were largely improvised, in comparison to the 'B-films', which were tightly scripted. This sequence of alternating A and B-films essentially ended with The State of Things in 1982. It began with Alice In The Cities. The first section of the film, in America, followed a script, but once Alice and Philip return to Europe, scenes in the film as the characters search for Alice's grandmother's house were increasingly improvised and determined in part by the contingency of the locations which the production found. Alice In The Cities was followed by The Wrong Move, scripted by Peter Handke, and based on Goethe's Wilhelm Meister's Apprenticeship. In reaction to The Wrong Move, the third of the 'road movies trilogy', Kings Of The Road, returned to an improvisational method. Wenders has written that this was partly inspired by visiting old cinemas in towns close to the border between East and West Germany. As the small crew moved from one location to another, Wenders would write up a scenario for the actors to improvise around the next day inspired by where they found themselves. This spirit of improvisation suits travelling by road. On the railways, with tickets purchased in advance for reasons of economy, and hotels to be met, this is rather more difficult. 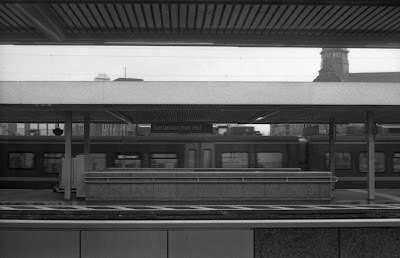 I had given myself a day in Wuppertal, and had a late afternoon ICE train to Hamburg. The stay at the hotel in Wuppertal included free use of the VRR integrated local transport system - including the Schwebebahn, the reason I had come to Wuppertal. Having visited the Gardasee Eiscafe in the morning, I contemplated going to Gelsenkirchen to look for the house that used to be Alice's grandmothers' (used to be in a double sense: in the film, Alice's grandmother has moved, "A Italian woman lives there now", thus negating a closed resolution to the film). Gelsenkirchen is within the VRR area, but an hour away from Wuppertal. 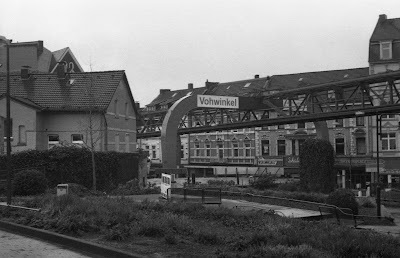 I looked at the possibility of travelling there from Vohwinkel (the last stop on the Schwebebahn, where the scene I described in 'The Phantom Ride' is shot); Vohwinkel S-Bahn station is a short walk away. There was not enough time to get to Gelsenkirchen, find the house, and return to Wuppertal to collect my luggage, and catch my train to Hamburg. However, I knew that Gelsenkirchen was in the general direction of travel. Picking up my rucksack from the hotel, I went to the Reisezentrum at Wuppertal Hauptbahnhof, located in a temporary building due to the vast rebuilding work at Doppersburg. It was possible: my hotel ticket would get me to Gelsenkirchen for no extra charge, and I could have an hour and a half there before I would need to take a connecting train from Gelsenkirchen to Münster, where I could join the Hamburg train that I was booked on; the ticket to Münster was a mere €11.60. Unfortunately, improvisation only gets one so far. Although I had printed a map showing a section of Gelsenkirchen from the station to the road where the house was (at least in the film; but again, Wenders has a particular fidelity to his locations, so there is no reason to believe this one is any different). In the film, they ask a passing driver, and he gives a name that appears in the subtitles as "Erdbrückenstrasse": with no such address in Gelsenkirchen, Erdbrüggenstrasse seemed a near-enough homophone. This I was unable to research any further online: Gelsenkirchen is untouched by Google StreetView. My map didn't have a scale on it, but I thought that the distance might be walked in half an hour. As in Wuppertal that morning, it was raining. I soon realised that the scale was deceptive and it would take me longer than anticipated. On one of the main roads, I took a look at a bus stop. There was a bus listed with the direction of Erdbrüggenstrasse. However, being a Sunday, there were only two buses an hour, and I had missed one by ten minutes, meaning the next was due in twenty minutes, at ten past four. My train to Münster was at 16:53. At this point I did realise that I would be unable to bring this improvised journey to its goal. 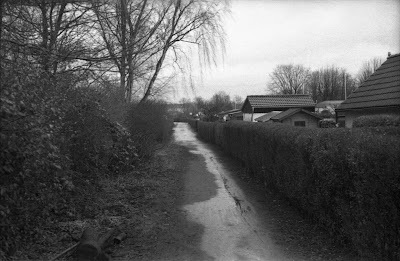 I walked another few streets in the direction of Erdbrüggenstrasse; when I had emerged from Gelsenkirchen station, the town centre seemed completely unlike the semi-rural setting that Alice's grandmother's house appears to be surrounded by in the film. By the time I had walked for just over half an hour, the character of the streets had changed. I reached Bulmker Park, where the roads around it had modest villas behind hedges and screens of trees. At the far side was a footpath leading North, alongside a plot of typical German summer houses. Here I stopped, pausing in the park, with bare dripping trees and two young men smoking in a shelter overlooking the small lake. I turned around, and walked back to Gelsenkirchen station. This was supplemented with my ideas, gathered from television and film, of what such a space might look like in the early 20th century ('Il Conde' was first published in 1908, although as much as I can remember what my drawing of Cafe Umberto looked like, it had more of a feel of the 1920s or 30s). The drawing did have the pillars with mirrors, crowded by the chairs and tables, all done with a box of pencils I had recently been given, ranging from 4H to 9B. I used this range for carefully shading in the drawing, a method quite given up on later, the idea that one might need more than one weight of pencil in a rendering. The original drawing is long lost, probably destroyed like similar juvenilia of the time, and if found would only be a disappointment. 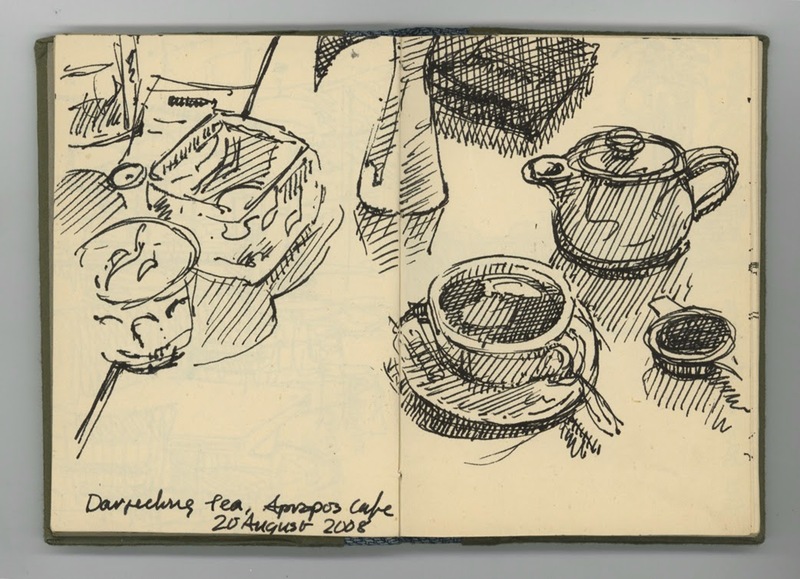 A drawing from the Cafe Apropos in Copenhagen will have to stand in for the Umberto.